From 2004 to 2016, Robert Wm. Blum, MD, MPH, PhD, was the William H. Gates, Sr. Professor and Chair of the Department of Population, Family and Reproductive Health, Johns Hopkins Bloomberg School of Public Health. He has edited two books, and has written over 300 journal articles, book chapters and special reports. In July 2007, Dr. Blum was named the Director of the Johns Hopkins Urban Health Institute. 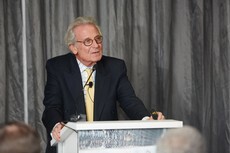 He is a Past-President of the Society for Adolescent Medicine; has served on the American Board of Pediatrics; was a charter member of the Sub-Board of Adolescent Medicine is a past chair of the Guttmacher Institute Board of Directors and served as chair of the National Academy of Sciences Committee on Adolescent Health and Development. In 2006, The National Academy of Sciences’ Institute of Medicine elected Dr. Blum into membership. He is a consultant to The World Bank, UNICEF, the United Nations Population Fund (UNFPA) where recently he authored the guidance on adolescent pregnancy, as well as the World Health Organization where he has served on the Technical Advisory Group of the Child and Adolescent Health Department as well as the Scientific and Technical Advisory Group of the Human Reproductive Program.